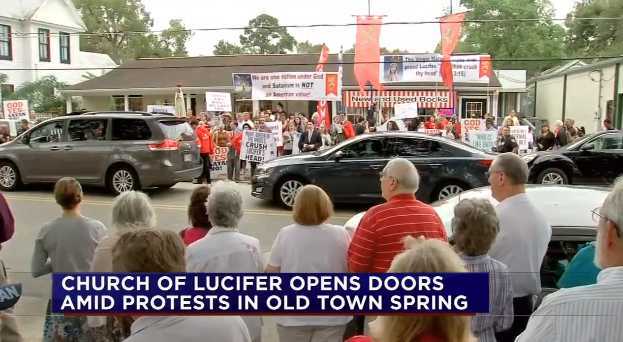 SPRING, Texas — The first Texas “Church of Lucifer” opened on Friday in a small town outside of Houston and was met with a variety of protesters from both the local community and those who traveled across the country. As previously reported, the Church of Lucifer was scheduled to hold its first meeting in Spring on October 31, opening its doors the day before. Co-founder Jacob No, who goes by a fictitious name to protect his identity since he says that the group’s beliefs are misunderstood, told reporters that the Church of Lucifer is not Satanic. No says that the services are not your typical church services and do not involve any preaching. No also states that the group does not sacrifice any animals. On Friday and Saturday, protesters took to the streets of Spring to speak against the gathering of the Luciferian group. “We are one nation under God and Satanism is not a family value,” one large banner read. “Life is short, death is sure, sin the cause, Christ the cure,” read another sign held outside of the small meeting place, where approximately 20 members arrived dressed in black. “I’m here to stand against a Satanic church,” Christopher Huff of Conroe Bible Church told the Houston Chronicle. No told reporters that he just wants to co-exist with everyone in the community, but supports the rights of the protesters.